The latest PPP polling from Missouri shows a tight race between John Brunner, Sarah Steelman, and Todd Akin (and shows all of them in a virtual tie with Senator McCaskill). Of particular note is the fact that Brunner has gained 7 points from the last poll in January and Steelman has lost 4 points. Of course, there are a lot of things going on, and it'd be a mistake to attribute the changes to one particular event, but it is worth noting that there's no evidence Brunner is suffering in the polls after having the courage to condemn the "we have to kill the Claire Bear" comments made at a recent tea party rally that Steelman attended. Nor is Steelman surging ahead after giving a pass to the comments, a position that was strongly rebuked in the Post-Dispatch. In other words, the poll offers little support that supporting violent rhetoric is key to wooing the conservative base. After Weinergate ended, a New York Times piece reported that two characters who had been interacting with Anthony Weiner on Twitter were actually "fake teens" who were being used to try to get information. Since then, most normal people stopped paying attention, and the story for those who were paying attention devolved into complete craziness. Basically, there were at least two "sides," one composed of prominent conservative bloggers and the other consisting of mostly anonymous Twitter accounts and blogs that really hate Breitbart. From what I've seen, the interaction between the two "sides" has basically consisted of nonstop allegations of law-breaking, death threats, sock-puppetry, impending lawsuits, impeding arrests, outing of anonymous accounts and vague references to "just wait until you hear about all this secret information I have." To be clear, this has been coming from both sides, though arguably the characters on the right are more interesting since they include prominent conservative bloggers and Breitbart employees. Anyway, it's really too much of a mess to try to describe in detail, though Cannonfire does a pretty good job here of expressing sentiments that are close to mine (including, for the record, crazy interactions with former Raw Story editor Ron Brynert). The main thing to be aware of for this post is that the post-Weinergate insanity is not a subject that can be adequately covered by lazy drive-by reporting. There's nasty behavior on both sides, sock-puppets abound, and anonymous individuals who are clearly trying to spread misinformation. Unfortunately, however, Buzzfeed not only fell into the trap of lazy reporting, they revealed themselves to be directly following a script provided to them by one of the right-wing bloggers involved in the mess pushing for his way of framing the issues. That news organizations get tips from the Right is not exactly surprising, but what I find amazing is just how shamelessly Buzzfeed followed a script publicly provided to them by the blogger alongside the magic words "Drudge bait." In the post, he's very critical of the right-wing conspiracies associated with Weinergate and specifically questions some of the claims of the right-wing blogger Patterico. However, Buzzfeed reporter Rosie Gray amazingly manages to turn the post (which is the primary source for her "reporting") into a story about "Weiner Trutherism" by "a handful on the Left." In support of her claim of "Weiner Trutherism," Gray shows an example of one Twitter account that suggested Weiner was "set up." Compare this to the other "side," left completely unmentioned by Gray, which consists of bloggers like Patterico, Ace of Spades, and Breitbart employees like Lee Stranahan and Mandy Nagy, who have their own crazy theories thus far unsupported by evidence. However, what I want to focus on is not so much which side is wackier, but rather how BuzzFeed came to report this story. As can be seen quite clearly, it directly followed a script provided to them by right-wing blogger Ace of Spades, who has a vested interest in the story, since he spent weeks bullying Gennette Cordova online and later claimed to have been threatened via anonymous email. In other words, he's not just someone reporting on the story; he's someone in the story. Note the flawed assumption that Weiner Trutherism is somehow a comparable story to Birtherism. Prominent conservatives, including many politicians (one of whom is about to become the Speaker of the Missouri House of Representatives) are birthers, and Mitt Romney is campaigning with newly crowned King of the Birthers Donald Trump. On the other hand, "Weiner Truthers," according to Gray, are a "handful" of people, and she only provides evidence of one person (an anonymous Twitter account) expressing the view Wiener was set up. Note also that Rosie Gray adopts Ace of Spades "Weiner Trutherism" terminology verbatim. And also the next day, with Ace finally using the magic words "drudge bait:"
Lo and behold, BuzzFeed followed the script perfectly (though suggesting they spent two hours on the story might be overly-generous). They lazily provided the right-wing spin, tweaking the content from Cannonfire's post about the crazies on both sides to sound like it was focused on "liberal Weiner Truthers." They waited until the weekend to release the story, as Ace suggested. And, as far as I can tell, the reporter Rosie Gray immediately took off for a long weekend after posting the story. What's worse, they don't even get the story correct, which is what usually happens when you're spoon fed talking points from the Right (Gray cites "one blogger familiar with the Weiner Truthers" at the end of the post"). Most of the conspiracy theories about Weiner have to do, not with the initial tweet that was sent out, but with whether there were people trying to set him up (as you might think from the New York Times story that there were people posing as teenagers). I do think it's a conspiracy theory to say that he was set up, since there's no evidence of that. Nevertheless, the fact that there were sockpuppets posing a teenage girls is pretty strange. The right-wing loves to push conspiracies about liberal groups secretly telling the media how to report. Well here's a clear example of a right-wing blogger dictating how and when BuzzFeed should tell their story. You'd think a media outlet would have a little more self-respect than to be so obvious about trolling for links from right-wing blogs. But just as Pavlov predicted, once they hear the magic words "Drudge Bait BBQ", they can't help but start drooling. “As you begin the next stage in your journey, you will encounter greed and selfishness; ignorance and cruelty. … You will meet people who try to build themselves up by tearing others down; who believe looking after others is only for suckers,” he said. So, in other words, President Obama is saying that people need to work together and care about their fellow citizens. And, of course, he was saying this in the context of a town that was completely devastated by a tornado and had been doing a good job rebuilding precisely because people in the town were willing to work together and had been getting help from other Americans. I honestly don't know how someone could be so ridiculous as to think that helping other people out and not being selfish is "evil." As @jbposnanski pointed out on Twitter, Hoft has all the makings of a cartoon villain, openly rooting for greed and selfishness while condemning "working together." Hoft's sentiments, of course, are also completely at odds with the Golden Rule and the New Testament, though he's happy to use his Christian beliefs to bash others. What a piece of work. By the way, here's the local coverage of the President's visit. I already spent 30 minutes defending the idea and trying to battle crazy permutations from Burns. The more people you tell about an operation, the more it 1) opens it up to unknown future problems, 2) good ideas have to defend against bad ones, 3) people running their mouths to Hartsock, CNN and other people who will cause additional unknown complications. Considering the complex dynamic with Hartsock, that he will see this CNN connection as his "big break," and that he's notorious for having loose lips, he certainly can't be trusted to keep this in confidence, and will speak to either people his age or perhaps even to CNN directly to curry favor. He should be given the vaguest details, and if he's very upset about the potential complication to his future, reminded that future operations will be newsworthy as well. Yesterday, Breitbart.com hyped another "We're totally not birther, BUT..." campaign demanding that the media wastes even more time digging around the birther issue. The Breitbots claim that Obama told his publisher that he's from Kenya, which is a pretty strange theory considering that a profile in the New York Times had already been published at that time where Obama clearly stated he was born in Hawaii. Oh, and the agency said the misdescription was the result of their own mistake. Barack Obama was either born in Kenya or he lied about it for years. Meanwhile, St. Louis radio stations like KFTK and KMOX continue to have Hoft on as a "very serious" guest. h/t Eric Boehlert via Twitter. Update: NicoleGennette on Twitter points out Hoft's long history of unabashed birtherism. GGI Cofounder Says Tea Party Needs to "Kill The Claire Bear"
At an event Thursday in Springfield, Mo., Scott Boston, a St. Louis area activist who has been involved with the Tea Party, told the crowd "we have to get Claire McCaskill out." "We have to kill the Claire Bear ladies and gentlemen," Boston said. "She walks around like she's some sort of Rainbow Brite Care Bear or something but really she's an evil monster." St. Louis grassroots activists have announced the formation of a new grassroots organization, dedicated to advancing conservatism at the national, state, and local levels. Scott Boston, Jennifer Ennenbach, Stacy Washington, and Dana Loesch formed the group out of a desire to promote issues and conservative principles in both policy and culture. Scott Boston, of course, has also blogged at Breitbart.com. He says he was just referring to McCaskill's nice image. Senator McCaskill is out with a new ad taking on special interests. This target makes a lot of sense given that people don't particularly like her potential Republican opponents but she's getting slammed daily by attack ads from Super PACs. 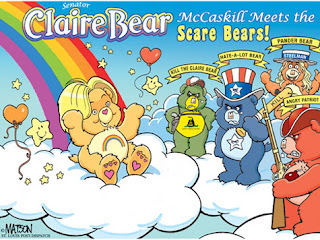 I think the 2012 election will in principle be a contest between McCaskill and Karl Rove.